NetSuite is the first application suite for mid-size companies that includes website and e-commerce functionality integrated with CRM and ERP business processes. Julie Winters is the E-Commerce Manager for Wolfe Electronics. 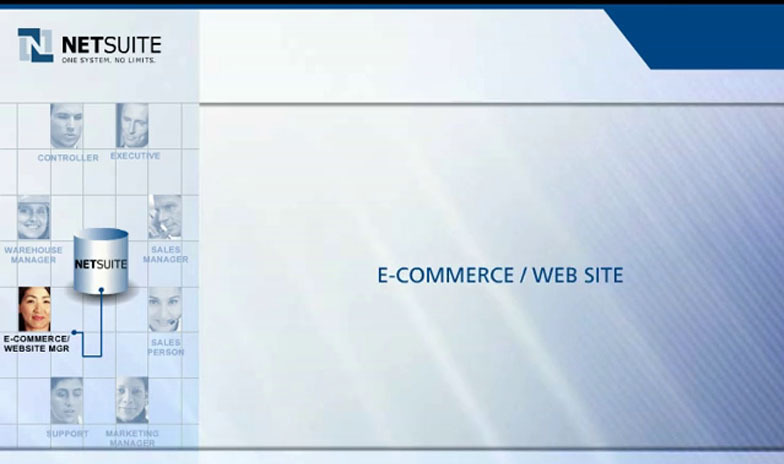 Julie manages the Wolfe Electronics webstore. The key to Wolfe Electronics’ choice of NetSuite was that they wanted to leverage the web to grow their business faster and more cost effectively. Julie’s previous work with a standalone e-commerce solution was filled with a lot of data transfer, errors, and customer dissatisfaction. Julie wanted to advance Wolfe Electronics with integrated pricing, inventory, and order management. Julie has now been able to lower costs and improve customer satisfaction with self-service for customers and partners. Turning to NetSuite, Wolfe Electronics has been able to tie together CRM, ERP, and online operations for accurate, seamless e-commerce. With the simplicity of NetSuite, Julie can support a product promotion this month is a computer monitor by updating the website and webstore with promotional pricing and copy on the fly. Mark Matthews, upon entering Wolfe Electronics’ website is attracted by their monthly promotion. He selects the monitor, orders them through his shopping cart, and completes checkout. Because NetSuite has integrated UPS tracking, Mark can later return to Wolfe’s site, access his account, and directly track his UPS shipment. Find out more about how NetSuite can take your business to the web.